This Person Badgered a Restaurant for Years to Bring Back This Burger. It Worked. Companies say "back by popular demand" pretty loosely. It often doesn't mean much. People may like the thing, but that doesn't mean it inspires the kind of passion the phrase insinuates. Those may not have been the exact words used by Red Robin to announce the return of its Oktoberfest burger after five years off the menu, but that was the gist of it. This time, for at least one person, the burger -- served on a pretzel bun with ham and spicy mustard -- absolutely inspired that kind of passionate response. "I had the burger in 2012 and loved it," Roxy Duffy of Hermosa Beach, California tells Thrillist. "I was super excited for the 2013 season to come around. Then I actually came to find out [the burger was] discontinued. They weren't going to bring it back, ever. It just kind of pissed me off." She began asking about the burger constantly, even tweeting at Red Robin daily for an entire year from a private account. Duffy had never done anything like this before. Friends and family convinced her to take the campaign public. She started an account dedicated to one thing: the return of the Oktoberfest burger. A quick search around social media shows that she's not the only person who enjoyed the burger or even the only one who asked Red Robin if it would ever make a return. But there's no one approaching the persistence and tenacity of Duffy. "I was jokingly determined," she says. "People would ask me, 'Do you think this is really going to work?' I was like, 'Yeah, of course. Why wouldn't it work?' I don't know if deep in my heart I knew that it would work, but as soon as I was talking to Denny [Marie Post]... I knew." Marie Post is the CEO of Red Robin, and she took note of Duffy's campaign. They began talking on Twitter. In the end, Duffy won. For a limited time, the burger is back on the menu. It's certainly not the first time a company has acted based on social media chatter. Make enough noise and many companies will respond, for better or worse. "Over the past five years, Red Robin has received hundreds of requests to bring back The Oktoberfest burger, but no fan spoke louder than Roxy Duffy," Marie Post told Thrillist via email. "She captured my attention, and we decided to make her goal a reality." It's easy to be cynical about brands acting like your friend on social media. (And lots of that cynicism is justified.) However, there's something kind of hopeful about Duffy's case. She was persistent, even if it was occasionally for laughs and her following wasn't the loudest. 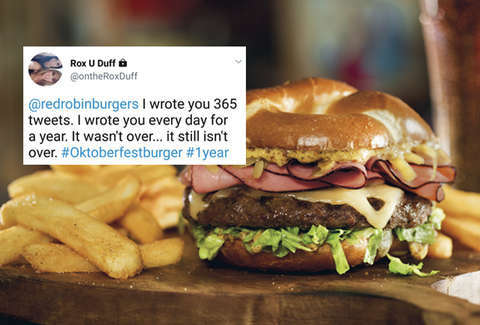 For her efforts, Duffy isn't just getting to taste the Oktoberfest burger again, Red Robin is throwing a party for her and her friends. Duffy is the guest of honor, undoubtedly, but she'll be joined by Marie Post, who is flying into town to enjoy an Oktoberfest burger with her.